Pharmacopoeia of Ayurveda in the beginning consisted mainly of plant and plant based drugs. Caraka Saṃhitā and other classics of Ayurveda utilized these medicinal plants extensively. However, a revolution took place during medieval period when minerals and metal based medicines made inroads into Ayurveda. It is difficult to establish the exact period in which the evolution in therapeutic application of metals and minerals got initiated. Perhaps it is during 6th century C.E. the use of metals and minerals as medicine gradually picked up and gained momentum. Probably it took another century for it to get itself crystallized into a concrete science i.e., Rasaśāstra. Rasaśāstra consists of the study of Mercury along with number of metals, minerals, gems and many plants and animals products. Primarily, dehavāda (living long and healthy life through use of formulations prepared from mercury and other metals and minerals) is the foremost aim behind evolution of Rasaśāstra. During the later period this science was also utilized for lohavāda (conversion of lower metals into precious metals like gold and silver). From the history, it is clear that Rasaśāstra was at its greatest glory during 8th Century C.E. because of the contribution of Nagārjuna. Many works were written and universities like Nalanda, Takshashila and Kashi were created for research and teaching of Rasaśāstra. Unfortunately in the attack of Mohammed of Ghazni (11th century C.E. ), nearly all available works of Rasaśāstra were destroyed. Though some texts were available; most of them dealing with lohavāda and majority of other texts were incomplete. Hence, it gave rise to a need to systematically compile the scattered knowledge of Rasaśāstra. This need was perfectly fulfilled by Vāgbhaṭa in the form of his written text Rasaratna Samuccaya (RRS). This treatise was written in 13th century C.E. by Vāgbhaṭa, son of Siṃhagupta. Name of the book itself suggests that it is a compilation (samuccaya) of gems (ratna) i.e. precious knowledge of Rasaśāstra. In the first chapter the author has clarified that after going through many texts of Rasaśāstra he has compiled valuable principles and prepared this treatise. In the present review, an attempt has been made to throw a light on the key features of RRS and to establish its importance and contribution in the field of Indian alchemy. Thus a critical review from the Suratnojjvalā Hindi commentary on RRS by Kaviraj Ambikadatta Shastri was done. The latter is a complete commentary which covers all 30 chapters of RRS and presently available everywhere and hence was selected for the present study. RRS was written by Vāgbhaṭa. The author himself has briefly provided information on his nativity and other details. Few consider the author of Aṣṭāṅga Saṅgraha and RRS to be the same and others consider them different. Gananatha Sen is of the opinion that the father of Vāgbhaṭa (author of RRS) was Saṅghagupta and not Siṃha Gupta. In the first chapter, while listing the names of Rasa Siddhas (persons who have succeeded in stabilizing mercury), Vāgbhaṭa lists Nāgārjuna (8th Century C.E. ), Govinda (10th Century C.E.) and Bhairava (12th Century C.E.) which hints the period of Vāgbhaṭa to be post 12 Century C.E. The author has also mentioned a disease, Somaroga which is not found mentioned before 12th Century C.E. The text has many references to Rasārṇava (8th Cent. C.E. ), Rasendra Maṅgala (11th Cent. C.E.) and Rasendracūḍāmaṇi (12th Cent. C.E.). Hence, RRS must have been written after 12th cent. C.E. A formula: Vaiśvānara Poṭṭali Rasa  mentioned in chapter 16 of RRS was prepared by King Siṅghal (1200 to 1247 C.E.). Also, mention of drugs such as Ahiphena (Papaver somniferum L.), and Vijayā (Cannabis sativa L.), which are not found mentioned before 12th Century C.E. strongly suggest the period of RRS to be from 1250 to 13th Century C.E. In the first chapter, Vāgbhaṭa, salutes 27 Rasa Siddha s and seeks their blessings. He goes on to explain the subject matter of RRS. This chapter describes various Rasas, Uparasas, Lauhas, Yantras, purification of Lauhas, extraction of Sattva, Druti and procedures of Bhasma etc., RRS consists of 30 Adhyayas (chapters) and the names of chapters are their respective numerical forms instead of the subject matter therein. The 30 chapters can be divided into 2 parts. The first 11 chapters provide information regarding pharmaceutical procedures of metals and mineralsand theoretical basis of Rasaśāstra. The remaining chapters mainly contain formulations for treatment of various diseases. These 19 chapters deal with pathology, symptoms, and types of diseases in brief and also the description of many herbo-metallic and mineral formulations in detail. The commentaries written on RRS, content of each chapter and classification of metals, minerals etc., into various groups are summarized in [Table 1], [Table 2], [Table 3] respectively. At the beginning, Vāgbhaṭa worships to Śiva, the originator of Rasaśāstra. The subject matter of RRS, description of Himālaya, origin of Hiṅgula, five types of rasas (mercury) worship of rasa, importance and effect of mūrchhita pārada are mentioned in this chapter. The commentator (Ambikadatta Shastri) has given an impressive contemporary clarification of blemishes of mercury mentioned in Rasaśāstra and also added detailed and valuable modern information regarding the origin, ores, availability and extraction of mercury. This chapter describes eight mahārasas (eight metals which are considered superior in processing mercury), their types, acceptable variety, therapeutic attributes, detailed procedures of purification and calcination. Capala is a controversial drug and may be either Bismuth or Selenium, but the commentator of RRS without providing any proof, correlates Capala with Bismuth. Relevant information of Abhraka (mica) and Mākṣika (pyrite) with the help of modern chemistry have made this chapter informative. This chapter deals with the description of uparasas (eight metals which are considered slightly inferior to mahārasas in processing mercury) and Sādhāraṇa rasa (eight metals which are considered slightly inferior to uparasa in processing mercury). The description structured similar to that of Mahārasa except that it lacks calcination procedures of Sādhāraṇa rasa. Scientific explanation is provided only for Gandhaka (Sulphur), Gaurīpāṣāṇa (Arsenic) and Añjana (Black antimony). Fourteen different Ratna (gems) and five best Ratnas, their relation to specific planets are described from an astrological point of view. Detailed and systematic description of lauhas (metals) is found in RRS for the first time. Types, attributes, purification, calciation and indications of each lauha are mentioned but methods to convert lower metals into precious metals is not given. It points towards the end of Lohavāda concept of Rasaśāstra as well as the impossibility of achieving success in stabilizing mercury. Good qualities required in a physician and assistant are quoted similar to that of Caraka Saṃhitā., Location and establishment of pharmacy, preparation of Rasaliṅga, method of worship of Rasaliṅga and the initiation ceremony for disciples are mentioned in detail. This treatise is not related with Dhatuvāda, although at the end of this chapter, the author suggests keeping the knowledge of Rasaśāstra a secret. This chapter presents systematic knowledge of pharmacy. Descriptions regarding ideal location required for building pharmacy, arrangement of instruments, various departments and eligibility of staff required in pharmacy etc., are relevant even in the contemporary times. Terminology is an essential part of Rasaśāstra because meaning of a word or collection of words may be quite simple in day to day affairs but could be totally different technically e.g., Kajjalī means a black coloured powder, but when this word is used in Rasaśāstra, it means black sulphide of mercury prepared from definite proportions of Mercury and Sulphur. ṭhis chapter contains 78 terms which were originally defined by Somadeva in his famous treatise Rasendracūḍāmaṇi. 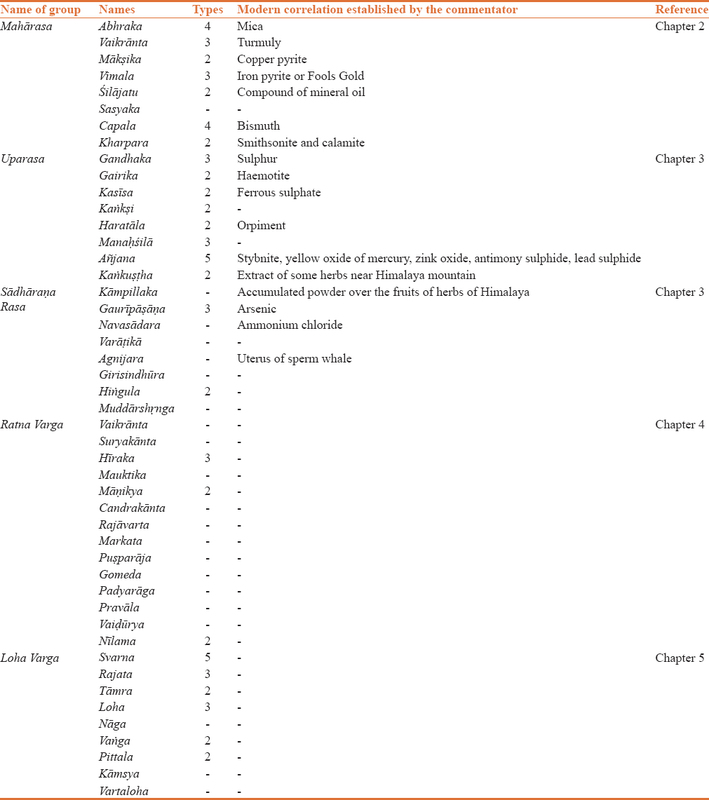 This chapter provides information on 31 different instruments required in pharmacy based on the description of Somadeva. Seventeen types of Muṣa (crucibles), their manufacture, four types of koṣṭhi (furnace), ten types of puṭa (various sized pits) for calcination of metals and minerals and terminology of 24 frequently used groups are mentioned in this chapter. Explanation of various units of measurements and Pārada aṣṭa saṃskāra (eight basic processing steps of mercury) are mentioned. Use of mercury is contraindicated in case of wound and burn. Dos and don'ts of diet while using mercury internally, measures to treat the adverse effects developed due to improper use of mercury or improperly processed mercury, 12 blemishes of impure mercury, procedures to remove them and 25 Pārada bandhas (stable mercury) are the contents of this chapter. This section presents therapeutic aspects of Rasaśāstra. From 12th to 25th chapter, treatment of 64 diseases is mentioned which include pathology, types and symptoms in brief and description of many useful formulations in detail. The 26th and 27th chapters are devoted to jara roga (geriatric diseases), rasāyana (rejuvenation) and vājīkaraṇa cikitsā (aphrodisiac therapy) respectively, through the use of both herbal and herbo-mineral formulations. Last three chapters (28th to 30th) are extraordinary and in that each chapter represents treatment of many ailments through the use of specific drugs e.g., lauha kalpa (formulations of iron), viṣa kalpa (formulations prepared from poisonous drugs) and pārada bhasma kalpa (formulations of calcinated mercury). According to PC Ray, RRS is a systematic and comprehensive treatise on materia-medica, pharmacy and medicine. Its methodical and scientific arrangement of the subject matter, would do credit to any modern work. Its value is further enhanced because the materia-medica is harmoniously blended with chemistry.Vāgbhaṭa also emphasizes the importance of scientific arrangement in the following words of his: “for its success, science must be systematic and the system must be scientific”. The systematic arrangement the subject of RRS is briefly summarized in [Table 2]. For a better understanding of Rasaśāstra, various terminologies, instruments and equipments should have been placed in chapters 2nd 3rd and 4th but are presently in the 8, 9 and 10th chapters. Because before getting to the main topics of Saṃskāra, Mahārasa, Uparasa, Dhatus etc., it is relevant to know the terminologies, measurements and various instruments used in the processing. Very few texts (Aṣṭāṅga Saṅgraha etc.) describe all the eight branches of Ayurveda. In Rasaśāstra, RRS is the only text that deals with all eight branches of Ayurveda. Total 15 commentaries have been written on RRS. Commentaries written by Ambikadatta Shastri, Indradev Tripathi, DA Kulkarni, Ashok Satpute, Siddhinandan Mishra and VA Dole are available today. Sanskrit commentary of Chintamani Khare is available at some places in Maharashtra. Ambikadatta Shastri, by writing the Suratnojjvalā hindi commentary has significantly increased the value of RRS. The commentator has iñcluded photos of various ancient instruments, detailed modern description of some metals and minerals such as Pārada, Abhraka, Añjana, Vaikrānta, Capala, Gandhaka etc., In the 11th chapter, the commentator has added various pharmaceutical details regarding Pārada saṃskāra. Comparative description of diagnosis, symptoms, type of diseases, pathya-apathya and treatment of several diseases based on available literature have also been compiled. 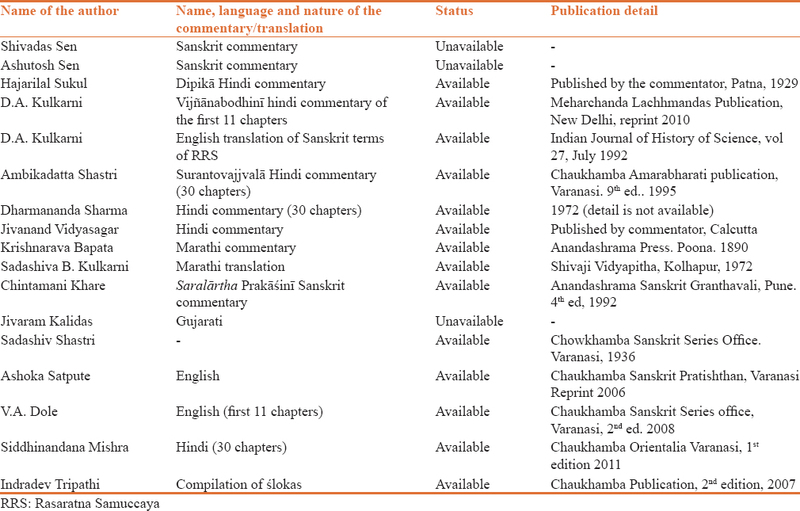 In the 20th chapter commentator has provided references of previous texts in the context of Kṣudra roga. In the context of rasāyana and vājīkaraṇa the commentator has specified other methods apart from those mentioned in the text. The subject matter of the last three chapters of RRS is not found mentioned in any Rasaśāstra text. It is not an exaggeration to say that the 28, 29 and 30th chapters have enough data to make physician specialist in the field of treating diseases through the use of only lauha kalpa, viṣa kalpa or pārada bhasma respectively. The most surprising fact observed in RRS is absence of even a single metal and mineral in all the formulations mentioned in the treatment of obstetrical and pediatric ailments. Hence, it may be the view of RRS that metallic/mineral or herbo-metallic preparations should not be used in pregnancy and children. Some controversies seem to be created by Vāgbhaṭa and explanations for these have not given by the commentator. In different sections, the author has mentioned four drugs viz. Svarṇamākṣika (copper pyrite),Manaḥshilā (realgar),Vaikrānta (tourmaline) and Kānta Lauha (cast iron) as best rejuvenators among all other drugs (Sarvarasāyanamagrajam). It appears to be a controversial statement because the title of the greatest can admit only a single candidate. E.g. according to Caraka, Trivṛt (Operculina turpenthum Linn.) is the best Sukhavirecaka (simple purgative). But in RRS, four drugs are pointed out as best rejuvenators. Hence, research may be required to establish best rejuvenator among four drugs mentioned. Classification of Mahārasa and Uparasa is found mentioned in 2nd and 3rd chapter of RRS, in each group includes 8 minerals. However, in the 6th chapter this classification is repeated and 3 minerals are included instead of 8 i.e., 5 minerals are excluded which were previously mentioned in chapter 2nd and 3rd. This may be mistakenly done by the author or may be interpolations by later commentators. 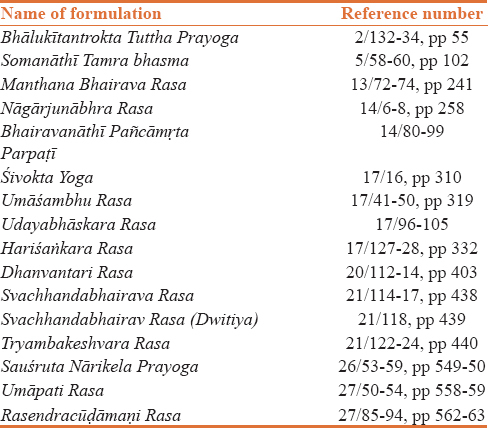 Few formulations are named by the name of ṛṣi (sage) and rasa siddha, such formulations are compiled in [Table 4]. All possible information about RRS is summarized in this work and hence it is expected that it may prove to be a valuable addition to the field of Rasaśāstra. In RRS, scattered knowledge of Rasaśāstra is well compiled by Vāgbhaṭa. 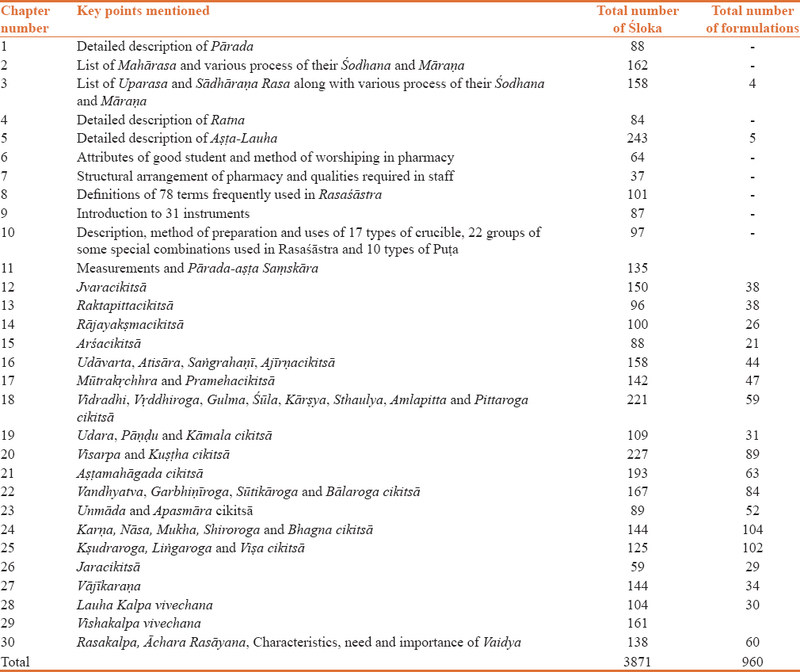 Critical review of RRS clearly shows that it is the best available text on Rasaśāstra which describes not only pharmaceutical and therapeutical aspects but also covers the eight branches of Ayurveda. It is a compilation but has its own specialty and consequence. The 22, 28, 29 and 30th chapters are the extraordinary features of RRS and need modern research to further establish their significance. Suratnojjvalā commentary by Ambikadatta Shastri has made this text more reachable. Modern description of all metals and minerals is not given by Ambikadatta Shastri but this gap is filled by other commentaries. Department of Rasashastra and Bhaishajya Kalpana, I.P.G.T. and R.A.
Satpute AD, editor. English translation of Rasendrasara Samgraha of Gopal Krishna, Introductory Speech. 1st ed. Varanasi: Chowkhamba Krishnadas Academy; 2003. p. 6. Shastri A, editor. Rasaratnasamuchchya of Vagbghata. 9th ed., Ch. 1, Ver. 8. Varanasi: Choukhamba Sanskrita Publication; 1995. p. 1. Rao BR, Sastry JL, editors. Evolution of Rasashastra. History of Ayurveda. 2nd ed., Ch. 9. Varanasi: Choukhamba Orientalia; 2010. p. 109. Shastri A, editor. Rasaratnasamuchchya of Vagbghata. 9th ed., Ch. 16, Ver. 117-23. Varanasi: Choukhamba Sanskrita Publication; 1995. p. 297. Shastri A, editor. Rasaratnasamuchchya of Vagbghata. 9th ed., Ch. 23, Ver. 15. Varanasi: Choukhamba Sanskrita Publication; 1995. p. 478. Shastri A, editor. Rasaratnasamuchchya of Vagbghata. 9th ed., Ch. 27, Ver. 85. Varanasi: Choukhamba Sanskrita Publication; 1995. p. 563. Shastri A, editor. Rasaratnasamuchchya of Vagbghata. 9th ed., Ch. 27, Ver. 116. Varanasi: Choukhamba Sanskrita Publication; 1995. p. 598. Sharma PV, editor. Ayurveda ka Vaigyanika Itihas. 8th ed., Varanasi: Chaukhamba Orientalia; 2005. p. 482-3. Kushavaha H, editor. Charaka Samhita of Agnivesha; Sootra Sthana. 2nd ed., Ch. 9, Ver. 6. Varanasi: Chaukhamba Orientalia; 2011. p. 140. Kushavaha H, editor. Charaka Samhita of Agnivesha; Sootra Sthana. 2nd ed., Ch. 9, Ver. 8. Varanasi: Chaukhamba Orientalia; 2011. p. 141. Dole VA, editor. English Translation of Rasaratnasamuchchya of Vagbghata. 2nd ed., Ch. 6, Ver. 2, Varanasi: Chowkhamba Sanskrita Series Office; 2008. p. 271. Bajpai RD, editor. Rasendrachudamani of Chudamani Mishra. 1st ed., Ch. 5, Ver. 1-153, Varanasi: Chowkhamba Krishnadas Academy; 2004. p. 50-77. Kulkarni DA, editor. Vigyanbodhini Commentary on Rasaratnasamuchchya of Vagbghata. 2nd ed., Ch. 1, Ver. 8-10. New Delhi: Meharchanda Lachhamanadas Publication; 2010. p. 2. Shastri A, editor. Rasaratnasamuchchya of Vagbghata. 9th ed., Ch. 6, Ver. 2. Varanasi: Choukhamba Sanskrita Publication; 1995. p. 122. Sharma PV, editor. Charaka Samhita of Agnivesha, Sootrasthana. 9th ed., Ch. 10, Ver. 26. Varanasi: Chaukhamba Orientalia; 2005. p. 64. Rasaratna Samuccaya, Suratnojjvala Commentary by Ambikadatta Shastri. 9th ed. Varanasi: Chaukhamba Amarbharati Prakashana; 1995. p. 123. Shastri A, editor, Rasaratnasamuchchya of Vagbghata. 9th ed., Ch. 6, Ver. 5-6. Varanasi: Choukhamba Sanskrita Publication; 1995. p. 123. Shastri A, editor. Rasaratnasamuchchya of Vagbghata. 9th ed., Ch. 6, Ver. 7. Varanasi: Choukhamba Sanskrita Publication; 1995. p. 123. Rao S, editor. English Translation of Ashtanga Samgraha of Vāgbhaṭa, Sootrasthana. 1st ed., Ch. 2, Ver. 3-4. Varanasi: Chaukhamba Krishnadas Academy; 2005. p. 15. Rao S, editor. English Translation of Ashtanga Samgraha of Vāgbhaṭa, Sootrasthana. 1st ed., Ch. 2, Ver. 24. Varanasi: Chaukhamba Krishnadas Academy; 2005. p. 19. Shastri A, editor. Rasaratnasamuchchya of Vagbghata. 9th ed., Ch. 2, Ver. 77. Varanasi: Choukhamba Sanskrita Publication; 1995. p. 49. Shastri A, editor. Rasaratnasamuchchya of Vagbghata. 9th ed., Ch. 3, Ver. 94. Varanasi: Choukhamba Sanskrita Publication; 1995. p. 75. Shastri A, editor. Rasaratnasamuchchya of Vagbghata. 9th ed., Ch. 2, Ver. 55. Varanasi: Choukhamba Sanskrita Publication; 1995. p. 45. Shastri A, editor. Rasaratnasamuchchya of Vagbghata, 106. 5/96. 9th ed., Ch. 5, Ver. 96. Varanasi: Choukhamba Sanskrita Publication; 1995. p. 106. Kushavaha H, editor. Charaka Samhita of Agnivesha; Sootra Sthana. 2nd ed., Ch. 25, Ver. 40. Varanasi: Chaukhamba Orientalia; 2011. p. 168.